3,701 km bicycle travelling started at Lake Van in Turkey´s Kurdish part through southeastern Turkey to Dohuk in Iraq, back to Turkey, crossing Anatolia northwards all the way up to the Black Sea to Georgia, into the Caucasus mountains and southwards to Armenia and Nagorno-Karabakh. Back across Armenia, Georgia and Turkey to Lake Van. 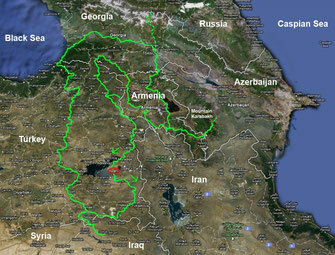 Do you like Cycling Kurdistan & Caucasus? Share Cycling Kurdistan & Caucasus! (508 km, 6,530 metres in altitude) Hardly landed in Van on the same Van Lake in the southeast of Turkey, I started the next day in an arc south over passes, through deep gorges and past numerous posts of the Turkish military through the southeastern part of Anatolia Target Iraq. (109 km, 893 metres in altitude) After a few strenuous but not so hot days I tortured myself now in unbearable heat of about 50 degrees (in the barely available shadow, mind you!) Slowly into the lowlands down to the Iraqi border. I got a stamp from the friendly Iraqi border official with my 10-day visa for the Kurdish north of Iraq! Currently, to the dreadful grief of the Kurdish population, due to the IS terror a possibly impossible for years! Not only because of the kindness of the people I would have loved to travel more of this country, but the incredible heat at that time, in early August, was even a little too much for even desert and heat lovers and so I returned to Dohuk, back to the Turkish border. (901 km, 9,139 metres in altitude) I crossed the extremely mountainous, Kurdish part of eastern Anatolia in just over 900 exhausting kilometers. After countless gorges, passes, dog attacks, often hurricane headwind and sometimes endless construction sites, I came just before the border with Georgia on the coast of the Black Sea. Promenades and beaches, what a contrast, and the Caucasus in the background! (498 km, 3,729 metres in altitude) I crossed the border into Georgia and relaxed my tormented bones one day in Batumi on the beach and let it go well. After many days in the remote mountains of Eastern Turkey, it was nice to see other travelers and tourists again, mostly Russians and Georgians themselves. A little further north I took a bath and a day of relaxation, before heading to East direction capital Tbilisi went. About Kutaisi with the imposing Bagrati Cathedral and some ruins and a smaller pass with tunnel crossing, it went downhill in many turns towards Gori. The road now led through a plain with the mountains of southern Georgia and further to the south those of Armenia on my right: the small Caucasus, in whose direction I would soon turn. On my left, since leaving the Black Sea, the Greater Caucasus. In sight, however, this time the province of South Ossetia, around which there have been war and violent clashes for decades. But on the main road everything was safe and so I rolled unharmed and speedy on the expressway to the capital Tbilisi, ten times larger than any other city in Georgia. I thought about cycling the Georgian Military Highway into the Greater Caucasus to the Russian border. But it was not even the almost 2,400 m high pass that had to be overcome, but rather the nice company that I had met in Tbilisi and the many touring people the same dislike of a track that you had to drive back again. So I decided, together with a Frenchman and a Japanese, the next day with a Georgian shared taxi, a marshrutka, the way over the serpentines to Kazbegi compete. For three hours we drove through breathtaking scenery and fantastic views, where I regretted a few times not to have cycled. In Kazbegi we moved into a simple room and hiked up steep paths up to the famous, almost all Georgian guidebooks on the cover adorned Tsminda Sameba church and a few meters further up to the glacier at over 3,000 m. We still took a taxi to the Russian border, which has always been closed to foreigners, where Elisabeth and Alexander from Moscow, on the more than 2,000 km long way to a family visit to Georgia, offered us a ride back to the capital. And so it was an entertaining gibberish out of their extremely sparse English and our extremely sparse Russian through the magnificent mountains of the Caucasus back to Tbilisi. After further exploration of the old town and the cathedral in the capital, I sat back in the saddle, for a long time to the south, towards the Armenian border, where I got my visa stamped a little later. (477 km, 6,946 metres in altitude) Through the impressive Debed Canyon we went further south. In Alaverdi I left my luggage in the room and fought twice the sometimes extremely steep switchbacks out of the canyon to two of the UNESCO World Heritage monasteries. Sweaty, but very worthwhile detour! Over some passes, it went up and down to the Sevan Lake, where I found no affordable housing against expectations. But the taxi driver Arman, whom I had addressed, drove in front of me to a somewhat rundown yacht club with a simple room right on the lake. Although this had no shower, but a sumptuous dinner in a nice round was included in the price. Arman then insisted on taking me later in the evening by taxi to an internet cafe in town and back again and I could do what I wanted, he took neither money nor anything else for it. So all I had to do was to thank him with a devoted and grateful smile and a generous handshake for his Armenian hospitality! My thoughts about whether this would happen to an Armenian with a German taxi driver in Germany, I kept it for myself. Along the lake, under dark clouds, we went over a 2,400 m high pass further south to the Noravank monastery, situated in a beautiful landscape. Between Nakhichevan, an enclave of Azerbaijan, on my right and Nagorno Karabakh on my left, we walked along the quasi-single road southward along the narrow southern tip of Armenia, with the hurricane-like headwind persisting throughout the day. So mostly I crawled at a snail's pace exhausting and over several passes and only after 100 km fight against the wind that gave way to a dense fog and finally I rolled in a light drizzle down to Goris. (71 km, 1,268 metres in altitude) After a few kilometers uphill and downhill I stood on the border with the Republic of Nagorno-Karabakh, occupied by Armenians and declared independent since 1991 on the soil of Azerbaijan, which is recognized by no other state. The border crossing ran smoothly and I got a visa stuck in the passport for 14 days, with the permit for the places I was allowed to visit. The former 100,000-inhabitant city of Agdam, almost completely razed in the war, was of course not on the permit, because as a ghost town right on the ceasefire line, it was an absolute restricted area. After making some inquiries in the capital, Stepanakert, I weighed both my own safety and that of the taxi driver, because I did not want to get anyone into trouble. After several conversations, a driver agreed to take me there if I did not mention his name and did not take pictures of him. So we drove out of the city in the mountains down into the lowlands, where until 1994, right on today's ceasefire line, the city Agdam stood, only recognizable by ruins and partly overgrown roads that led through endless, almost completely bombed streets. The only three people we saw were scrap metal collectors or men sitting on the side of the road, who, according to my driver, had lost their minds about the cruelty of the war and had not found their way back to an orderly life. We gave them bread and water and quickly left the restricted area. The museum of soldiers killed in the war rarely seemed to be visited by foreigners, because I was greeted by the very friendly, middle-aged woman at the cash desk and personally conducted around. She stopped in front of one of the countless walls with tens of thousands of men's photos and pointed at one of them. It was her husband. I was not keen on cycling back 170 km on the same, only road I had come from the middle of Armenia. Also, my departure in Van in eastern Turkey slowly approached and due to the Armenian-Turkish border, which had been closed for a long time, I still had to make the detour back via Georgia. So I negotiated long and complicated with another taxi to bring me and my bike the next morning to Yeghegnadzor, from where I wanted to start on new ways back north. The next morning, of course, nobody came and only after some time replacement was organized in the form of a small Lada, with which we chugged to the border and further back through Armenia to the north. (480 km, 4,826 metres in altitude) Of course, I rounded up the amount agreed for the taxi again and invited for a coffee, then we said goodbye, before it went by bike uphill and downhill to the north. The snow-capped peak of the Ararat rose behind a bend and passed it to Yerevan, which compared to the rest of the country is a vibrant capital of Armenia with sidewalk cafes, huge markets and interesting cathedrals in the city and nearby Echmiadzin. On Gyumri we went further north, always uphill and downhill towards the border of Georgia, before I asked a day later even on the next border. I drove back to Turkey via a small picturesque pass road near Akhaltsikhe. (658 km, 7,652 metres in altitude) About many endless construction sites with pavement of coarse gravel, it went sometimes steeply uphill and downhill, every now and then with strong headwind south to Kars. After a detour to the ruined city of Ani on the border with Armenia, we passed the west side of the Ararat, to Dogubayazit on the border to Iran. With the way further to the south and the rising temperatures unfortunately also the stones threw children to. Partly I was shot at with fist-sized boulders from a slingshot, so that I even went to self-protection as the first to throw a stone to bring the approaching children from the concept. On the one hand this was only moderately successful and on the other hand a rather sad scene, which had nothing to do with why I was traveling by bike on a land. Glad to not have been hit and furious at the annoying spectacle, I dulled on pedaling south, pitching my tent on the shores of Lake Van and rolling into Van the next day, back to my starting point. The stones were soon forgotten. On the other hand, I will never forget my time in Kurdistan and the Caucasus, the spectacular landscapes and above all all the hospitable and helpful people that I got to know.